· 70/30 COMBINATION FOROFF-THE-CHARTS SOFTNESS: 70% Bamboo 30% Cotton is the perfect mix for any bestquality Muslin Swaddle blanket. Bamboo fiber makes the fabric softer whichprovides the cloth the ability to get even softer after every wash. 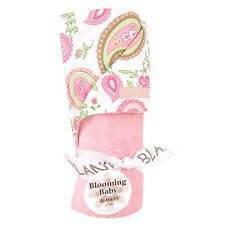 This baby swaddle blanket is a perfect swaddling blanket for your little girl. 30" x 40" Receiving Baby Blanket. 1 ply Interlock Knit, 7.2 Oz. From Circo (Target). Baby Girl Pink Owl Blanket. Super Soft Fleece. Our 4 Layer Muslin quilts have all the wonder of muslin fabric x 4. The extra layers of muslin in our quilt gives your baby more warmth while not loosing comfort. Our quilts are machine washable and get softer with every wash.
Wrap baby in total snuggly softness with this Minnie Mouse™ fleece blanket by Disney Baby™! The colorful blanket features a fun Minnie Mouse™ print on super-soft fleece material. 2 Infant Blanket 30"x40",Lovely design and dotted plush fabric backing. 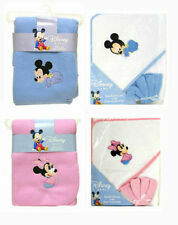 3 Super soft,warm and comfortable for the delicate skin of your baby. 5 Perfect gift for baby. This one fits adults, can also use it to cover your legs in office or when travelling. 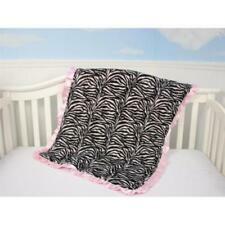 Very nice light weight swaddle blanket in very good used condition. Clean and free of stains and signs of use. It's made from 100% cotton with double layers for more security. Allows baby's skin to breathe and provides warmth and comfort. Gets softer with every wash and digitally printed colours will never fade away. • 100% COTTON. • MAKES A GREAT GIFT. Boritar Newborn Baby Blanket Pram Crib Basket Infant Toddler Girl Boy 30"x40"
Provides the touch stimulation critical to newborn babies. Luxurious baby receiving blanket. Super soft 200 GSM fleece. Wide satin border on all four edges. Snuggle baby in sweet style with the Pink Lemonade Jersey Knit Baby Blanket from cloud island™. This cozy cotton blanket is perfect for wrapping baby for snuggles, laying out as a place for baby to play or draping over the stroller to block out wind or sunshine. Front is made of a super soft plush flower minky print. Green, pink, red, and blue flowers. The ribbons are looped and of different widths, colors, prints and textures. Wonderful baby gift. Great for snuggling and comfort. Snuggle your sweet baby up in theBaby Blanket & Kitty Toy Set by Betsey Johnson. Machine wash. Infant Blanket 30"x40",Lovely design and dotted plush fabric backing. Perfect gift for baby. It's the most cost-efficient baby blanket. Perfect when travelling. Super soft,warm and comfortable for the delicate skin of your baby. The Set includes a Blanket that is 37'37, a newborn baby hand dress, headband and a free pair of barefoot sandals! Newborn available! We've been working since 2002 on creating the most comfortable, cute and refined pieces of clothing for your little ones. Boritar Baby Blanket/Crib Quilt Soft Minky Double Layer Dotted Backing 30"x40"
Baby Blanket 30"x40",Lovely Pink Elephants Printed and dotted plush fabric backing. Perfect gift for baby. It's the most cost-efficient baby blanket. Perfect when travelling. Super soft,warm and comfortable for the delicate skin of your baby. New - Premium Muslin Cotton Swaddle Blankets -3 pack Large 47" x 47"
One blanket is light pink with kites in pink and purple sailing across, the other a lovely floral print. Super soft muslin. Comfy, open weave design. Perfect for swaddling, nursing and cuddling. Machine wash for easy care. Boritar Baby Blanket Minky Blanket with Dotted Backing Dinosaurs Printed 30"x40"
Boritar Baby Blanket Soft Minky with Double Layer Dotted Backing 30"x40"